CCP invites old players back to test out the game's improvements. It seems there are a lot of players out there who tried CCP's F2P shooter Dust 514 back when it launched, but failed to be impressed. CCP admits as much on its website, saying "perhaps the mechanics weren't polished enough for you, you had issues in Planetary Conquest, or were otherwise just not happy with it." They feel the player's pain, and have done a lot of updates since then. To get former players to come back for a second round, they're starting a welcome-back program that will hand you some free dropsuits to play with. All accounts that have been inactive for the last 60 days will be gifted 100 copies of both the Black Eagle Scout and Quafe Scout dropsuits. These accounts have also been accruing passive skill points, so returning players will have a ton of stuff waiting for them. Since its launch, CCP says that they've tweaked almost every aspect of the game. The dropsuits, weapons, and modules have all been rebalanced, matchmaking has been improved, vehicles have been reworked, and the controls have been touched up. 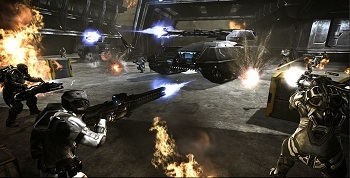 Recently, CCP has been vocal about overhauling Dust 514. Last week, its new producer talked about the plans he has for the Eve-connected shooter. While he claimed that he was only going to make an awesome game better, the welcome-back program seems to admit to a few more flaws. However, games are fluid things today, and hopefully Dust can get the momentum to push past it. I think it's odd that they reward people for not playing the game. All active players should get the same benefits at the least. Put it on PC and I will consider playing it. As I stated in the thread about it's new producer; the game isn't bad, but lacks a hook. It does have an interesting system that supposedly tied it to EVE online. The corps were supposed to fund you as you took on missions. Money gained from completing missions went to buying new gear. Yes, you had to buy, as well as sustain your own gear. You buy an armor set, but when you die it's gone. So you buy multiple sets of the armor, the weapons, the tanks, etc. And to use certain weapons you needed certain skills. The management aspect is interesting, but it's not enough. After all is said and done the game plays out like a rather generic FPS shoot/multiplayer. Huge maps allow for large teams which is nice. Just nothing that jumps out and sinks it's teeth into you. It's almost a lower grade version of Planetside 2. I guess that's a decent comparison. You can indeed buy better weapons, just not as costly. I wanted to see this game do very well. I thought it had a lot of potential when I played it, but it just felt...average. FOV probably killed a lot of it for me too, it's rather narrow, even compared to other online console first person shooters. One problem I had was, it enabled full keyboard and mouse controls, but for what purpose? Most people will play with a controller on a console, and chances are the people using a mouse were going to dominate. The game has almost no aim assist at all (At least from what I played), and kind of felt like playing Planetside 2 with a controller. I tried to get my friend to play, but he never seemed to get into it, so he never played again after the first time. Something about the inventory and skill tree system being needlessly complicated. I agree in a way, the menus for that are rather annoying to go through. Maybe they fixed most of this, since I haven't played since my PS3 stopped working. As nice as it is that they're giving people who didn't like Dust a reason to give it another chance I do have to agree with toms - they really need some incentive for people who loyally kept playing. I imagine if I had kept playing as they carried on improving it and then saw this it would irritate me to the point of not playing any more. As I stated in the thread about it's new producer; the game isn't bad, but lacks a hook. It does have an interesting system that supposedly tied it to EVE online. The corps were supposed to fund you as you took on missions. Money gained from completing missions went to buying new gear. Yes, you had to buy, as well as sustain your own gear. You buy an armor set, but when you die it's gone. So you buy multiple sets of the armor, the weapons, the tanks, etc. And to use certain weapons you needed certain skills. That sounds really interesting, but there are some parts of it that seem like they just don't work in practice. I wouldn't mind if there was a separate RTS-esque element where you have to finance your gear through some other means, but tying that element directly to another MMO (even one as micromanagement and business-oriented as EVE) is suicidal, since the crossover of the two audiences is somewhere around "Damn Near Nonexistent". And yeah, I wonder what active members get from this. Sounds like the people that stuck with Dust are getting shafted here. Wanted to like this, especially as I was a big Eve addict in the past but it's really just not that special at all. Average is probably erring on the generous side and the menus and loadout sections are truely awful, making it a chore to do even the most basic of things. CCP just aren't up to the task, I can see why they wanted to push it on the PS3 being an untapped market and all but their product is far from great and even has little to do with Eve proper. I think Eve online is viable on PS4, be good to see them join many other developers and bring previously PC exclusive MMOs to consoles. Doubt it would happen though, much as I doubt Dust 514 will last another year. If it wasn't for my girlfriend who installed it on her PS3 and asked me to try while she wasn't at home, I wouldn't have even touched this, and once I did for about 5 minutes I stopped altogether and never tried it again, It's a shooter game on a console, which was the first "No" for me, it was pretty damn slow, and aside of the "backstory" that was sort of interesting, it had nothing else rooting for it.